» Hydro Flask vs S’well – Which is the Better Water Bottle? Hydro Flask vs S’well – Which is the Better Water Bottle? A good reusable bottle for water should be attractively designed, easy to drink from, insulated to keep water (and other beverages cold) and be durable enough to last a year or more. Many outdoor enthusiasts end up with their own favorite brand of a bottle for water, but for those that have yet to pledge their loyalty to one company, it’s worth it to shop around before settling. The ever-growing eco-friendly green movement has made reusable water bottles more popular than ever letting go the single-use plastic options, which has brought some amazing companies into the spotlight like Klean Kanteen, and the two brands we are going to review today that use BPA Free steel for their hydration systems. Two companies you can never go wrong with are Hydro Flask and S’well water bottles. The average person would be happy with either insulated bottle, and while both are very nicely made and durable, there are a few easy key differences between them to consider. High Level Take: For my up front assessment, I much prefer the Hydro Flask available here because it is more versatile and cost effective than the S’well. 18/8 stainless steel bottles. Triple-walled and vacuum insulated. How is Hydro Flask Designed? Hydro Flask reusable water bottle is easily the more well-known of the two brands, which goes to show that this steel bottle has been a longtime favorite of many different types of people for quite a while. Hydro Flask bottles are vacuum insulated stainless steel bottles that are as equally popular for serious outdoor adventurers as they are for daily water bottle use around home, work, and school. NOTE: We first reviewed the Hydro Flask in depth here. These various different lids really goes to show just how versatile Hydro Flask makes their steel bottles. Even if you tend to like a regular screw-on cap, being able to switch to a sports cap when you’re working out or a straw lid for when you’re enjoying a large bottle of cold lemonade on a lazy day is a great feature. Hydro Flask reusable water bottle is available in a huge range of color options, including classic black or white and super bright colors. The powder-coated colored bottles (Which are not dishwasher friendly) have a comfortable texture that makes it easy to hold, while the stainless steel bottle option is very sleek and smooth. The 18 to 24-ounce steel bottles are their most popular and are slim enough that they are easy to hold while drinking. All Hydro Flask stainless bottles are designed with TempShield technology which is a double-wall durable insulation design that keeps cold beverages cold for 24 hours and hot beverages like coffee, hot for up to 6. This vacuum-sealed stainless design doesn’t sweat either, which means icy cold water in your steel bottle won’t leave slippery condensation on the outside of the bottle, regardless of how hot or cold the temperature is outside. As you’d guess, Hydro Flask steel bottles are made of 18/8 stainless steel. Not only does this leave Hydro Flasks pretty much unbreakable and for average use, but also means the taste of the beverages won’t become trapped in the bottle as plastic bottles so often do. HydroFlask BPA Free bottles are priced anywhere from $24.95 (For the latest prices and discounts, check here) for a 12 oz standard mouth up to $59.95 (For the latest prices and discounts, check here) for the giant 64 oz wide mouth. The S’well water bottles is a newer brand, but one that has already gained quite the loyal following, particularly amongst women. S’well was created by Sarah Kauss, a highly respected female entrepreneur that had a goal of creating a more attractive yet minimalistic stainless bottle that would appeal to a different group of people and have a lot of color options so your daily hydration looks fabulous. 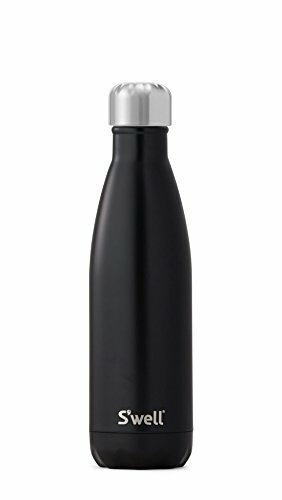 For example, the overall look of a S’well stainless bottle is likely more enticing for those that need a daily bottle for around home and some hot coffee at work, while Hydro Flask is more attractively designed for outdoor enthusiasts or those that just want a tough bottle that does the job and hopefully with a lifetime warranty. S’well steel bottles have a huge range of colors and patterns that rival majority of water bottle companies out there. Overall the bottles are very sleek and compact, easily held and they fit in majority of cup or tumbler holders. S’well steel bottles look very pretty but are also just as tough as other 18/8 stainless steel bottles. These stainless bottles are triple-walled and vacuum insulated. They create no outside bottle “sweat” and are rated to keep drinks cold for 24 hours and hot for 12. The S’well brand is also partnered with UNICEF USA and donates a portion of their proceeds to water programs, with their focus currently on Madagascar. 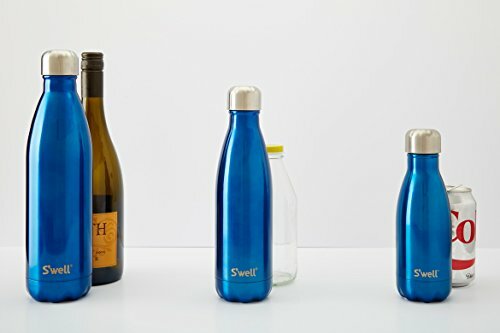 S’well stainless bottles follow the same type of price structure for the most part – About $25 (For the latest prices and discounts, check here) for 9 oz, $35 (For the latest prices and discounts, check here) for 17 oz, and $45 (For the latest prices and discounts, check here) for 25 oz. Some collections are more expensive however, such as Metallics for $42 (For the latest prices and discounts, check here) and only in 17 oz. When it comes down to Hydro Flask vs Swell, Hydro Flask steel bottles comes out on top. Though the S’well stainless bottle is beautiful and will clearly be more attractive to some, the Hydro Flask steel bottle is a better everyday bottle that can handle outdoor adventures and sports. Hydro Flask stainless bottles have a wider mouth and you can easily put standards ice cubes in them to keep your water cold for longer. The wider mouth and less slim design also means cleaning a Hydro Flask steel bottle is easy. That being said, if you need a very slim bottle to carry due to the size of your backpack the S’well could be a better choice. Also, though both bottles actually keep icy drinks colder for longer than rated (based on customer experience), the S’well seems to keep drinks cold for just a little bit longer or hot so you can enjoy a good coffee. Bottom Line: Hydro Flasks are less expensive and come in a much wider range of sizes and mouth options. The numerous compatible caps add a lot of versatility, something that sadly stands out with the S’well only coming with a standard screw-on cap that doesn’t even have a loop. Overall the Hydro Flask (available here with frequent discounts) is more at home in the backcountry while the S’well is better suited for carry at home. Klean Kanteen vs Hydro Flask– Choose one!